I am convinced that if we could squeeze the original Star Wars trilogy between the palms of our hands, we would be left with a really good, really pure Hatha Yoga practice. Remember this dialogue between young Luke Skywalker and his teacher Obe-Wan Kenobi? Obe-Wan: Remember, Luke..a Jedi can feel the force flowing through him. Luke, Stretch out with your feelings! Obe: Good! You’ve taken your first step into a larger world. Imagine back to the greatest state of innocence that you can possibly recall. The way it felt last time you stood in the middle of a wet forrest and allowed the smell of the forrest floor to overwhelm whatever else might be happening in your life. Or leaning with your back up against the sturdiness of an old tree, for example. Or staring out at the Pacific Ocean in a way that worked to both fill and empty the heart simultaneously as your feet sunk just a little, the perfect amount, into rough and salty sand. Back and back and back. Because these are the states that work to open the body. And as my teacher Sofia loves to repeat, ‘Freedom IS an Open Body!’ It has taken me about a decade to realize this in the way that I have wanted to realize it, which is more now from the place of experience and less from that of the sheer gutsiness that it took to make my mind up to trust her in the first place. In the house where I grew up, my kid-bedroom had a magical crawl-space, most practically fated for storage purposes. But I saw this crawl-space as absolutely sacred in that it had a latchable wooden door and, for some reason, it was also carpeted, painted, and well & softly-lit. This was my place. It saved me. I saved it. Every day after school, I would crawl into this sacred place for the unfurling of imagination with my three best friends. In time, the room collected all kinds of things of our loving. We had a record player and all of our favorite records from ‘The Muppet Story’ to ‘Chicago 17’ to all of Cyndi Lauper. The music evolved over time. But I can certainly remember listening to ‘Girls Just Wanna Have Fun’ about a thousand times on repeat in there, and I can also remember taking the time to transcribe every word to every song that I had ever truly fallen in love with, as if my life depended on it. And, who knows, maybe it did. In that cave-like place somewhere in the the midst of suburban condominium sprawl, innocence lived and thrived. A pod of girls talked, giggled, confessed, wrote poems, and called and hung up on boys. And…and this is very important!…we also did inversions on the wall because the wall space was just about high enough for the extension of our legs in what-we-didn’t-know -then was Viparita Karani. It just felt good to be upside down, and it was fun. So now, as I hang wall ropes and curtains in the small & cozy-perfect room in the back of the graceful studio that is Steadfast & True in Nashville, Tennessee, I am giving out a giant Divine Wink. It is all starting to make sense. This place, this sanctuary, this return to some place that is so new and so strangely, beautifully familiar. Place-allujah! I believe that people can change. And I’m going all the way. I’m even willing to bet my entire life on it. Not a dollar though on the idea that Yoga or anything else for that matter, tangibly or intangibly outside ourselves, will budge us even a smithereen away from the habit-patterns that run our lives and keep dragging us back to some old, familiarly-smelling mess. So much popular Yoga these days is about throwing ourselves into shapes that we are not necessarily at all prepared to meet. As a result, we ride on the kinkiness that is already our spine. We crank our necks and our backs. Our egos might think that it feels good…and maybe it does, for the moment. At least we won’t feel the pain of it all until later. Sometimes, much, much later. Why do we do this? Why do we think that these forms, devoid of internal, honest engagement, will do a damn thing to help us? I would like to undress a giant secret about the practice of yoga for anyone out there who cares to know. It’s not about the pose. It’s about what’s inside the pose. Who is in there? What is she inspired toward? How fully is she reaching? What we want is for the inside of our yoga poses to look something like the ceiling of the Sistene Chapel. Something in us is reaching. The spine takes a risk and comes to life. 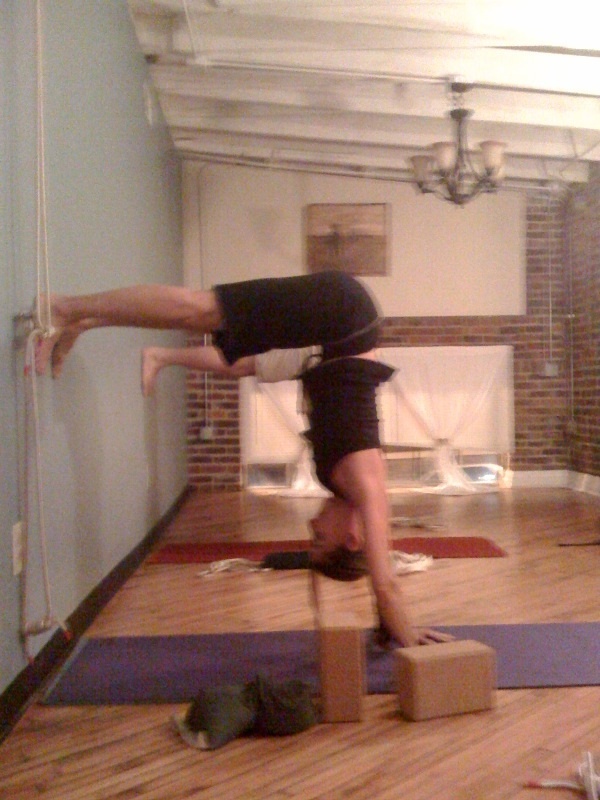 Yoga is more about the application of our imagination than we might realize. It’s about waking up the light and the energy that animates the body and makes us feel alive. It’s the flight of the imagination inspired by the energy of the body. It’s not Yoga that is going to save you. I asked one of my very young students today, “What is it that you most want to manifest through this body at this moment in time?” She took a little time to think about it. Then she said very matter-of-factly: Happiness. There are moments in life as a teacher when the simplest thing said or done by a student reflects it all back in a way that feels like a torrential downpour of light. Thank you.